In a surprising move, a top Dalit rights organization, Dalit Bahujan Adivasi Collective (DBAC), has taken strong exception to Prof Romila Thapar, one of the foremost historians of India, for the 2016 Ambedkar Memorial Lecture (AML) at the Ambedkar University, Delhi (AUD). Professor emeritus at the Jawaharlal Nehru University (JNU), Thapar recently threw her weight behind the students during the recent police crackdown on JNU campus. The lecture has been organized on the 125th birth anniversary of Dr BR Ambedkar, April 14. Raising the pitch against Thapar, who has been a long-time critic of Hindutva idologues, the DBAC said, thought it "respected" her "vast body of work", the differences with her do not just stem from "her upper caste identity alone." DBAC underlined, the differences are also ideological in nature -- "due to the fact that most of her intellectual and political positions have largely been determined by a Left liberal ethos, which in its Indian avatar has overlooked, to a great extent, the centrality of caste in social, political, economic, and cultural formations." 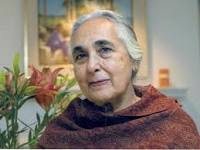 "This lacuna, which we can broadly identify even in Prof Thapar's work, is also a by-product of an array of privileges (including her upper caste/class location)", the DBAC said, adding, "Also significant in this context is the fact that her body of work has shown no direct commitment to Ambedkar's radical vision on history and politics." Providing a list of previous speakers, the DBAC, which has written a letter to the university vice chancellor, said, all those chosen by the university to speak on the occasion in the previous years also represented "the same upper caste discourse which preserves the status quo and has suppressed those interpretations of Indian history and society which have emerged painstakingly from the margins over several decades." Going ahead with its sharp critique, the DBAC said, "This naturalisation of privileges is in fact detrimental to the development of Dalit, Bahujan, Adivasi and minority discourses on history." Calling itself a "student collective that is motivated by Ambedkarite vision and thoughts", with a strong backing of a section of Dalit academics and professionals, the letter asked the vice-chancellor to "immediately reconsider Prof Romila Thapar's selection to deliver the Ambedkar Memorial Lecture in 2016 and consider more relevant scholars." It further said, "Henceforth, in the selection of speakers to deliver the AML, there should be an institutional mechanism to ensure participation of onlyscholars from Dalit, Bahujan, Adivasi and minority communities; scholars from any other backgrounds who have had a longstanding commitment to Dalit, Bahujan, Adivasi and minority discourses in ways that mark them in the league of Ambedkarite scholars; and scholars whose work has engaged directly with Ambedkar's own speeches and body of writing." Calling selection of speakers for AML series "exclusionary" the letter said, "Addressing such issues is especially urgent in the context that this year, the University is celebrating the 125th birth anniversary of Dr BR Ambedkar." It goes ahead to say, "It hardly needs restating that the upper castes (savarnas led by the Brahmins), by carefully and wilfully sustaining a caste hierarchy, have monopolised the production of knowledge within academia, both in India and abroad. Such hegemonic practices have systematically and consistently placed hurdles before Dalits, Bahujans, Adivasis and minorities from accessing spaces of knowledge production on equitable grounds." "This", the letter said, "is more than evident given the overwhelming representation of savarnas in both faculty and student positions across universities in India. Such monopolisation is accompanied by other (very often invisible) forms of institutionalised caste discrimination both within and outside the university space." 2015: Aruna Roy – Is unbridled capitalism a threat to Constitutional Democracy? "While these speakers may be some of the 'best minds' of the country, it is more than evident that there is a clear (if not deliberate) pattern of exclusion of scholars from Dalit, Bahujan, Adivasi and minority communities", the letter insisted. The claim of DBAC may correct but restricting people like Romila Thapar may not be the solution. We must keep in mind that most of them are known for their anti-caste & anti-Brahmanism position except Ashish Nandi who has openly accused Dalits as most corrupt last year. We need to make them more accountable by challenging them instead to exclude. Otherwise, people who are against Dalit will use this position as an opportunity. DBAC must be careful and reconsider it's decision. warmly !